Tucked in our Evangelical Lutheran Worship is a list of commemorations (page 15). Though such observances aren’t as prominent as feast days and lesser festivals, they do have a role in our liturgical lives. 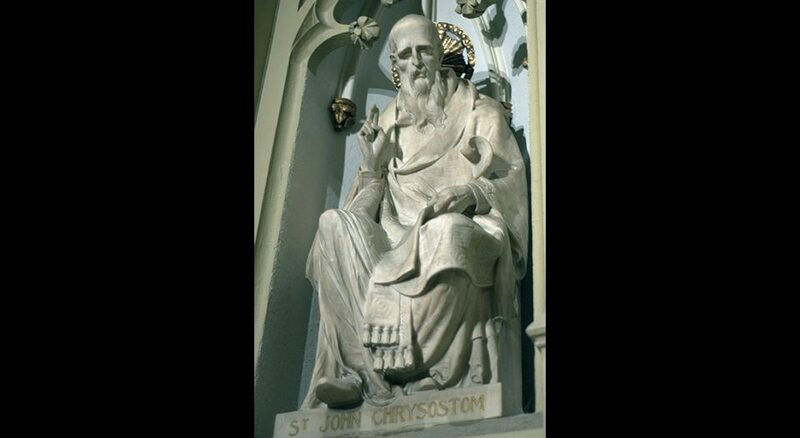 One such commemoration honors John Chrysostom (347-407 CE), a priest who became bishop of Constantinople. Chrysostom, “golden mouth” in Greek, was so named because of his exceptional oratory skills. He was trained both in rhetoric and scriptural interpretation, a combination often labeled “sacred rhetoric.” While we take for granted the marriage of these two disciplines in preaching, it wasn’t prevalent in his day. The bishop is honored for his eloquent, scripturally grounded and contextual preaching. Chrysostom is esteemed by the Eastern Orthodox Church and by the Roman Catholic Church. (In 1908, Pope Pius X designated him the patron saint of Christian preachers). He was so skilled in oratory that congregations were moved to applause. But Chrysostom distrusted such applause given its undue attention paid to the preacher instead of Christ, so he encouraged preachers to be indifferent to praise, noting that the “example of one’s life is a better lesson” (Jaroslav Pelikan, The Preaching of Chrysostom). He was so eloquent that, even when he preached against applause, such an announcement, ironically, “brought the house down with applause” (Pelikan). The next logical step of such a mode of interpretation was to pay attention to the everyday concerns of people in the congregation and community. Chrysostom’s vast collection of sermons show that he did just that. For example, some 90 sermons focused on social themes of poverty and wealth and exhorted hearers to care for the poor and hungry. Even more, he practiced what he preached by leading his community to care not just for one another, but for the whole community. Chrysostom railed against abuses of ecclesiastical and political authority, even as he himself served as bishop of Constantinople. In his sermon series On the Statues (377 CE), he “illustrates his compassion as well as his social responsibility in a time of political crisis” (George Kennedy, Classical Rhetoric and Its Christian and Secular Tradition). It was this kind of preaching that caused an uproar among those in power and eventually led to Chrysostom’s exile. But exile didn’t silence him as he continued to find ways to communicate, to proclaim. Such diligence unfortunately led to a second exile, a long journey through difficult terrain that weakenped Chrysostom’s undernourished body to the point of death. “Ironically, the one whose oratory moved congregations to wild applause was persecuted for his criticism of the megalomania of public officials and preachers” (Richard Lischer, Theories of Preaching). Chrysostom preached more than 200 sermons based on the Pauline epistles. Perhaps it was the Antioch connection that led to his fondness for Paul (recall that Paul began his first missionary journey from Antioch). Or perhaps it was the similar way the two downplayed their eloquence by …. well, by being eloquent. “When I came to you, brothers and sisters, I did not come proclaiming the mystery of God to you in lofty words or wisdom” (1 Corinthians 2:1). Commit to being fully engaged in the world. Hannan is associate professor of homiletics at Pacific Lutheran Seminary of California Lutheran University, Berkeley, Calif.